The U.S. Department of the Interior has directed the National Park Service to initiate a program designed to attract more young people to our country’s most cherished National Places. 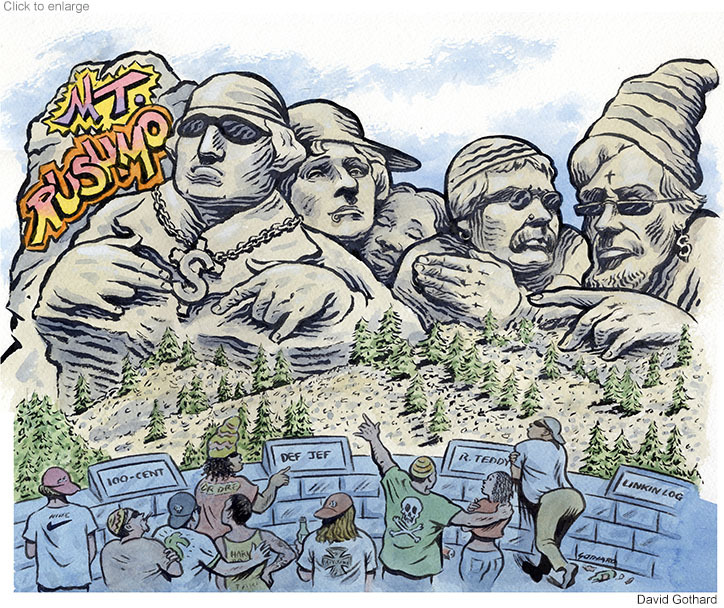 Dubbed Mo’ Monuments, the first phase of the plan calls for upgrading the street cred of the venerable Dead White Men in the Black Hills of South Dakota with a hip-hop refurbishment. Named a bridge n’ tunnel for him, n’ nearly ev’ry other brother. But he had a beard named Martha n’ real cojones in his crotchy. Brought d’ boyz to Mount Vernon for some Minute Man sessions. Got elected President without the help of Judge Scalia. Did eight years in DC, tagged his name all round the hood. Never smiled for the cameras cuz his teeth wuz made of wood. But his own slaves was totin’, steada’ tokin’ his tobacco. Had a mandinga called Sal, makin’ sure he got in her pants. So he wizzled the White Hizzle, kept it rizzle for shizzle. So Tom purchased Louisiana – yo, that dark meat was kickin’. Sally had a mocha baby – this Poundin’ Father was prolific. He’s Dead President number three, but a two dollar bill? Juan had unprotected funkin’ when T’s goin’ rat-tat-tat. McKinley grooved on Mistah Bully so’s he made him his Veep. Rooz got to be the Top Dog when McK’s capped by a creep. A man, a plan, a canal, Panama, splittin’ the isthmus. Buggin’ dudes makin’ hats, musta’ thought it wuz Christmas. Set up the U.S. Forest Service, kept the parks free of litter. Wanted a nice, neat place where he could ice some furry critter. Had anger management issues, changed his name to plain Tiddy. Got tagged by a shooter who took him for a Bull Moose. Debated Douglass, flashed his link, did his erective duty. Mary Todd, his loc old lady, coulda’ ruled Prozac Nation. Ditched the wife, slept with dudes, was a Greater Masturbator. Wuz comped two seats in a box, that’s some presidential perk. Wilkes Booth offed him in Act II, killa did a Linkin Murk. Presidentz just like Gangstas, bein’ shot and gettin’ jiggy.